It was the sensation of the age. Sir Arthur Conan Doyle had been ailing for some time; few were surprised when the grand old man of English letters finally passed away, on July 7, 1930. What was unexpected was the vehemence with which he apparently refused to remain in his grave. The first – sighting – came within six hours of Doyle’s death, when his spirit manifested through a medium in the English Midlands. Within 48 hours, mediums as far apart as Vancouver, BC and Wilkes Barre, PA; Paris and Milan; Sunderland and Sussex; were reporting meetings with the departed Doyle. From his office in London, the psychic investigator Harry Price registered 17 reports of the author’s return within that same two day span, and three years later, in 1933, he admitted, – today, my waste paper basket still gets jammed with newspaper clippings. – In life, Doyle had possessed a titanic presence. In death, he became practically Brobdingnagian. Most people have at least one book by Sir Arthur Conan Doyle in their library, be it a collection of the adventures of the redoubtable Sherlock Holmes, or one of the equally enthralling adventure yarns he penned elsewhere in his career, as he searched to escape from the behemoth of Baker Street. Few beyond the most devoted collectors, however, have paid much attention to the vast body of writing which Doyle unleashed throughout the last twelve years of his life, and which he himself claimed represented the on-going development of more thought and research than he had ever expended on any other subject. In 1916, Doyle publicly announced his – conversion – to Spiritualism, proving his zeal by all but exclusively devoting his energies to the subject until the moment of his own death – at which point, one presumes, he would have discovered precisely how reliable his beliefs really were. His writing echoed his faith. Between 1918 and 1930, Doyle wrote, edited or translated some 30 books, fully two-thirds of which pertained to Spiritualism in some form or another. To his public, still hungry for more tales of Sherlock Holmes, these books were an irrelevance; with few exceptions, they sold poorly, and many of them have remained out of print for decades. Indeed, by the late 1920s, Doyle was reduced to publishing, or at least reprinting, the books under his own Psychic Press imprint, editions which are even more sought after than the actual Firsts. A handful of books, most notably 1926’s two volume History Of Spiritualism, have subsequently reappeared beneath sundry specialist imprints. Others still, having fallen out of copyright, can be freely obtained from various Doyle-related internet sites: at the time of writing, the text of The New Revelation (1918) and The Vital Message (1919) can be acquired in this way. Elsewhere, his final book, The Edge Of The Unknown (1930), was revived within Time Life’s Collector’s Library Of The Unknown, in 1991. Of the twenty or so titles which remain, however, it is luck alone which guides the hopeful collector; that, or a wallet capable of competing with the heavy-hitters of the Holmes brigade, that hardy breed whose appetite for Holmesiana is such that many booksellers, and auction houses too, have created a generic Holmes category into which any Doyle book can be placed, regardless of its subject matter. Not that Doyle’s Spiritualist writings are too far removed from the tenets of Holmesian study. In other hands, it is true, his words might easily have formed a decidedly flimsy argument for Life After Death – Doyle rarely sought concrete proof that the events he witnessed were genuine. For him, his faith was sufficient. But these works offer a fascinating glimpse into the author’s mind. There is a distinctly supernatural angle, for example, to several of Holmes’ adventures, an angle which could never have been wrought so successfully had Doyle not already been inclined towards Spiritualism. Similarly, the faintly superhuman aspect of many of Doyle’s other fictional creations would also, through the light shed by his later writings, become clearer: Doyle fervently believed in man’s ability to rise above his customary station of pettiness, spite and greed, and these qualities are frequently evinced in the heroes of his novels. This same belief was amongst the threads binding Doyle’s last books; it would also, perhaps ironically, become the theme of what was touted (by its publishers, at least) as his first posthumous work. Thy Kingdom Come was a spiritual manifesto for man which Doyle supposedly communicated from beyond the grave. In 1931, it was claimed, Doyle appeared to a brotherhood of adepts living in a Himalayan retreat, in a state of considerable despair; as man advanced, he explained, and grew further apart from the spiritual beliefs which had once sustained him, the spirit world had fallen into stark decay. Like the Slum Reformers of Victorian England, Doyle was now on a Heavenly mission to restore humankind to a state of spiritual grace… if not for its own sake, then for that of the Other Side. The Himalayan Brotherhood relayed Doyle’s dilemma to – a certain occult brotherhood in France, – who in turn recruited a medium capable of summoning Doyle to her side, and a copy typist who would dutifully record his words. Thy Kingdom Come, Doyle’s recipe for a better world (and a healthier Hereafter), was the result. Doyle himself was a devout supporter of – posthumous authorship, – devoting one chapter of 1930’s The Edge Of The Unknown to an impassioned defense of similar efforts purportedly dictated by Oscar Wilde and Jack London. However, even he argued for some – internal evidence of the author’s identity, – and sadly, Thy Kingdom Come offered little. Contemporary reviews described it as nothing more than generic spiritualist mumbo jumbo, only lightly disguised by the lofty pretensions of its alleged authorship, a charge which subsequent reprints have not lessened. Scarce, but scarcely valuable, even in its first edition, since its 1933 debut, Thy Kingdom Come has resurfaced (as The Return Of Arthur Conan Doyle) on at least five occasions, most recently (since 1963) under the aegis of the White Eagle Lodge, a non-denominational Christian organization. Seated in his office at the National Laboratory of Psychical Research at the time of the book’s initial appearance, Harry Price doubtless consigned his copy of this slim volume to the same jammed waste basket as the news-clippings. He knew, as all the author’s other friends and fans surely knew, that Doyle would hardly have resorted to such overly- mystical means in order to get any – message – across. Painfully aware as he was of the skepticism which his beliefs aroused, Doyle would never have ventured to the Himalayas. He would found a far more mundane route than that. Discussing Doyle in his own autobiography, 1933’s Leaves From A Psychist’s Case-Book, Price wrote, – there is not a spiritualist living with the same dynamic personality, driving force, dogged grit, tenacity of purpose, fighting qualities, large-heartedness, and world-wide prestige that the great High Priest of Spiritualism possessed. Yet Price, revelling in his role as the Prince of real-life Ghostbusters, would also admit that his relationship with Doyle was often strained, occasionally hostile, and sometimes downright appalling. They were both explorers in the psychic field, Price explained, but they were – diametrically opposed – in their beliefs. Whereas Price was convinced that even the most inexplicable phenomenon had an animistic cause, and devoted much of his career to unmasking the fraudulent mediums and all-round charlatans who preyed on the gullible public’s psychic appetite, Doyle championed the most unworthy cases, often flying in the face of even hard-nosed evidence of duplicitous chicanery. Evidence which was frequently furnished by Price. Price was everything Doyle was not, with one exception. He, too, was a prolific author, and one whose writings are today revered by students of the supernatural. Over the course of three decades spent painstakingly researching the psychic world, Price wrote some two dozen books, and several hundred essays and magazine articles, all devoted to documenting, in the most ruthless scientific terms, the phenomena in which Doyle placed his faith. In stark contrast to the often pitiful fate of Doyle’s books, however, Price was a born best-seller. Naturally cynical though it is, the reading public is nevertheless captivated by – true – tales of the supernatural, and even Price’s driest paragraphs possessed the innate ability to captivate and thrill. Again, modern publishers have maintained only a fraction of his output in print, but his key works can regularly be found in used bookstores, usually at very fair prices (another sign of their original popularity). Indeed, his most famous book, The Most Haunted House In England (1940), joins Doyle’s The Edge Of The Unknown amongst the star attractions in the Time Life series. All of this, of course, is simply further tribute to the man’s astonishing ability to tell a great story. Whether his audience was a team of earnest fellow researchers, in the sterility of a lecture hall, or a roomful of housewives in a church hall in the sticks, Price could lend the dullest tale a sparkling luminescence. An uneventful night spent in a distinctly unhaunted house became a masterpiece of suspense; an unembroidered legend became a Homeric epic; and once on the trail of a fraud or a trickster, of course the gathering of insignificant clues could not echo anyone by the Sherlockian sleuth himself. By the time Price got round to finally exposing the charlatan, the audience would be utterly spellbound. Trickery, knavery, downright dishonesty, Price was exposed to every guile in the charlatan’s book; might even have invented a few more himself. A skilled conjuror, he knew precisely what could be accomplished by sleight of hand, and a roomful of mirrors. Attempting to test the veracity of one family who claimed their home was haunted, he turned common wine into thick black ink, just to test their reaction, then threw – spectral – stones across the room to see what they would do. If their house wasn’t really haunted before he arrived, they would certainly think it was when he left! Doyle detested Price’s methods, but could not help but admire his tenacity – high praise indeed from the creator of that most tenacious detective of all. Yet the passion which unquestionably united, but simultaneously divided, these two great minds, belied the fact that under other circumstances, their lives could scarcely have been more dissimilar. By the time Price was born, on January 17, 1881, Doyle was already a young man of 22, on the verge of completing his medical studies at Edinburgh University. While Price encountered his first poltergeist at the age of 15, when he spent the night in a so-called haunted manor close to the family home, Doyle had been chasing shades around the country for close to half a decade.And by the time Price made his first appearance in print, with a (now absurdly rare) numismatic handbook, The Coinage Of Kent – published by his local (Sussex) historical society, Doyle was already the highest-paid author in history, earning a colossal ten shillings per published word. It is, then, pure coincidence that the two should have stumbled upon the themes which would ensure their subsequent fame – and immortality – within weeks, maybe even days, of one another. In January, 1888, the seven year old Price watched enthralled as – The Great Sequah, – an itinerant magician and illusionist, performed for a curious crowd on a cold London street. That same month, the Southsea based MD Arthur Conan Doyle received the first in what would become a tidal wave of plaudits for his novella, A Study In Scarlet, published the previous month in Beeton’s Christmas Annual. 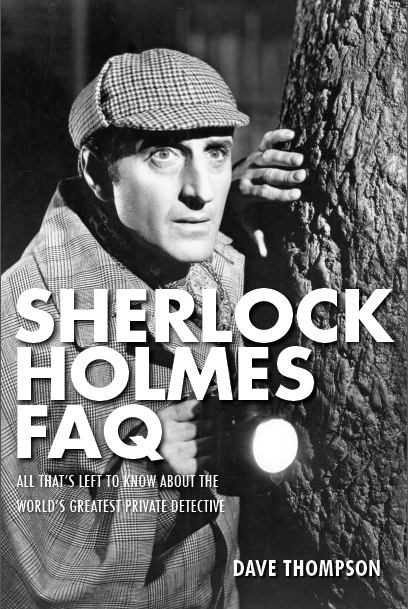 The story, of course, marked the literary debut of Sherlock Holmes. Deception (for what else, after all, can conjuring tricks be described as?) and detection – two worlds which are poles apart, but are inextricably linked regardless. It was indeed a wry fate which decreed that having made these subjects their own, Price and Doyle should literally reverse their roles for the rest of their lives. While Price, through his relentless pursuit of psychic jiggerypokery, would one day rival Holmes himself, Doyle, with his childlike credulity, would prove as easily impressed as – The Great Sequah – ‘s young admirer. It was bitter irony, too, which decreed that Doyle should emerge as the champion of the psychic world at precisely the same time as Harry Price erupted as its earthly nemesis, in the aftermath of the Great War of 1914-1918, and the massive revival in Spiritualism which was wrought as millions of bereaved families sought to come to terms with the loss of their loved ones on the killing fields of France and Belgium. It was Price’s campaigning against the obvious charlatans which this revival unleashed which first brought him to public attention – and animosity. Doyle’s induction into the upper echelons of Spiritualism was considerably smoother, if no less controversial. At first, his pronouncements on the subject were regarded as simply the latest hobby of a notoriously butterfly mind; over the years, Doyle had unleashed his passions upon a myriad themes, passions which threatened at times to consume him whole. But they had passed; in 1916, when he publicly averred his support for, and belief in, the afterlife, it was assumed that this, too, would pass. Yet there is no doubt that Doyle was sincere in his beliefs; just as there was no doubt that, if he continued down this path, he would one day cross swords with Harry Price. The only real surprise was that it took so long. Not until 1922 did the two men publicly take up arms against one another, when Doyle rushed to the defense of the spirit photographers Ada Emma Deane, whom Price was then thinking of investigating, and William Hope, whom he had already denounced. It was, – Doyle admonished the researcher, – very wrong to try and ruin a man [Hope] who had long years of fine psychic work behind him. Spirit photography is, as its name suggests, the act of photographing spirits, an art which, as the camera itself approached the centenary of its practical invention, was seen by many as the next logical progression in the development of the science. There have, over the years, been a great many photographs published which appear to show a figure, or object, which was not there when the picture was taken. Never, however, so many as were produced during the early 1920s, after Doyle included a discussion of the subject in his second Spiritualist volume, The Vital Message (1919). Over the next few years, spirit photography became little short of a national pastime, as amateur cameramen from all walks of life raced to capture their own spooky images on film, and in 1922, Doyle contributed to a new (but today, little known) book on the subject, The Case For Spirit Photography. A wonderful book, as much for the unflagging belief of its (otherwise obscure) contributors, as for the almost foolish credulity of many of their opinions, the book is also noteworthy for the sustained attack on Harry Price which Doyle launched from its pages. William Hope, Doyle insisted, was above reproach; an unselfish man whose only wish was to turn his inexplicable gifts to the service of others. He charged only for the cost of his materials (which, naturally, were more expensive than those a – conventional – photographer might require), and in return, he brought hope and happiness to all who consulted him. Price, on the other hand, was nothing more than a base skeptic, the very premise of whose work, under – controlled laboratory conditions, was frequently as fraudulent as he claimed his victims to be. Price struck back the following year, whilst giving a lecture to a psychic research group in Hove, just a few miles from Doyle’s old medical practice in Southsea. To the delight of the assembly, Price revealed how Doyle, on a visit to New York the previous September, had visited the famed American psychics Eva and William Thompson, a well-known duo whom Price himself had already written off as nothing more than a rather entertaining vaudeville act. During the course of their seance, the Thompsons brought back Doyle’s own, long-departed mother, a display which allegedly reduced their illustrious visitor to tears, copiously shed while he embraced the figure. Three days later, the Thompsons were unmasked as fakes, but had Doyle even commented upon the affair, much less explained his emotional outburst? No he had not; in fact, it would be May, 1924, before Doyle finally broke his silence, when he somewhat belatedly informed Price that not only had he not hugged the spirit, he had known the whole thing was a put-on from the start. Price, however, had only just begun to combat Doyle. Early in 1923, Doyle’s attention was brought to bear on some remarkable occurrences taking place in Yorkshire, where two schoolgirls, 16 year old Elsie Wright and her ten year old cousin, Frances Griffiths, had apparently taken the first ever genuine photographs of the fairies which lived at the bottom of their garden. The Cottingley Fairies became an immediate cause celebre. The girls’ photographs appeared in magazines around the world; visitors flocked to Cottingley in the hope of catching a glimpse of the sprites; and the scientific world was in uproar. For as many scientists who could prove beyond doubt that the fairies were fakes, conjured up with nothing more than a few paper doll cut-outs, there were others who were equally adamant that they weren’t. Doyle, with the erudite support of theosophist Edward Gardner, fell face first into the latter category. The Coming of the Fairies, published that same year, is perhaps the best-known (but infuriatingly hard-to-find) of all Doyle’s spiritualist writings. Selling respectably at the time, it has since acquired a degree of notoriety which ensures that even tattered copies rarely stay on bookshelves for long; even today, there is something utterly irresistible about the idea of Doyle, the brain behind the most analytical mind in literary history, falling for such a simple childish prank. For it was a prank. While Doyle and his friends launched themselves into a serious debate over the true nature of the photographs (did they depict real fairies? Or were they another manifestation of spirit photography? ), Harry Price readily demonstrated precisely how a simple childish game had so spectacularly backfired upon the adult world. The true nature of the Cottingley Fairies notwithstanding,the vogue for spirit photography faded as quickly as it had arisen; even as Doyle continued to vouchsafe its veracity, the infant art was finally despatched to an early grave by the unmasking of its greatest practitioner, the aforementioned Ada Emma Deane. And this time, Harry Price wasn’t involved. Ms Deane’s fame rested on her ability to photograph the dead warriors whose spirits accumulated around the Cenotaph, a newly erected war monument in London’s Whitehall. Price had attempted to arrange a controlled sitting with this redoubtable talent, but failed; in November, 1924, however, editors at the newspaper The Daily Sketch were studying one of her photographs when somebody noticed something familiar about one of the wraiths. The photograph was enlarged, and suddenly the whole picture became clear. The face was that of a famous soccer player! So was the one beside it; so were another and another. Within a matter of days, The Daily Sketch had exposed the wretched woman’s trickery, and while the spiritualist world itself continued to champion her efforts, the public’s taste for her trade was finally exhausted. The truce was not to last, however. In January, 1926, while Doyle gave his first, and vehemently anti-Price, speech as the newly elected president of the London Spiritual Alliance, Price himself was standing two floors below, hosting the opening of his National Laboratory of Psychical Research, an organization which apparently stood against everything the Alliance represented. The fact that the Alliance (and therefore, Doyle) was the Laboratory’s landlord only amplified the forthcoming flashpoints. Mrs Deane and her phantom footballers remained a bone of contention between the two men: Doyle continued to support her long after members of even his own organization began doubting her credentials. The half-decade old Thompson incident, too, would spark a major confrontation, after a reporter mistakenly referred to one of Price’s earlier lectures (in which Doyle was again ridiculed) when reporting on a more recent one (in which Doyle was not even mentioned). Contemporary logic, and Price’s own (allegedly not-inconsiderable) vanity vouchsafed just one response: Price himself. Doyle, however, cited Harry Houdini, then rubbed further salt into his adversary’s wounds by refraining from even mentioning Price’s name, or that of his Laboratory. A reasonable parallel might be a history of rock’n’roll which doesn’t mention Elvis Presley. In this latest battle, he begged to be rid of Price altogether, and yet they did reconcile, and just in time. Doyle was not long for this world, and over the course of his last few months, he and Price finally kindled the friendship that their undeniably deep mutual respect should have nurtured years before. One reason for the cessation of hostilities was Price’s increasing absorption into a new case, one which continues to enthrall ghost-hunters (and debunkers) even today. Price was first alerted to what would become known as “the most haunted house in Britain” in June, 1929, when he was commissioned by the Daily Mirror newspaper to investigate “a most unusual poltergeist case that was disturbing the inmates of a country house somewhere in the Home Counties.” Price was on the scene within 24 hours, not imagining for a moment that Borley Rectory would not only cement his name in the national consciousness, it would also dominate the last two decades of his life. Price’s enthusiasm knew no bounds, and the public lapped it up. Two books on the subject, The Most Haunted House In England in 1940, and The End Of Borley Rectory (1946), became bestsellers. He published over a dozen articles on the subject, and gave as many talks on British radio. With other authors since adding their own observations and theories, there are now as many books on Borley as there were ghosts in the place to begin with. And there were an awful lot of ghosts. Borley was everything Price dreamed a haunted house should be; between October, 1930 and October, 1935, Price estimated that upwards of 2,000 poltergeist phenomena were experienced at the Rectory. Mysterious lights shone through the night; bells rang, footsteps echoed. Coins and medals flew through the air. When Life magazine despatched a photographer to Borley, the ghosts obligingly raised a brick off the ground for the cameraman’s personal benefit. Unknown writings appeared on the walls. Heavy objects were hurled at the occupants, and when Borley burned to the ground on February 27, 1939 (an event which the spirits had predicted precisely eleven months beforehand) spectral figures were seen passing through the flames. Even today, with every last physical trace of the Rectory having disappeared, it remains an eerie site. Harry Price was in his element. Now resident in Ogden, UT, Vincent O’Neil is the son of Marianne Foyster, whose first husband, Lionel, was the Borley incumbent throughout this period. He recalls, “Sir Arthur never really knew about Price’s latest project, passing away shortly before Borley first hit the headlines.” But still O’Neil enjoys imagining what might have transpired, had Doyle lived to witness, and perhaps even join, his most favored foe in an investigation of the phenomena. Would both man have stared into the other man’s eyes looking for clues as they prepared for a joint seance? Both were members of the Society for Psychical Research and were accustomed to all manner of supposed paranormal events. Whether from the touch of a ghost, or the tension between two dedicated spiritualists, the electricity the two would generate during a seance together would be something to behold! Sadly, imagination is all anybody has to cling onto, with even fiction failing us here. Amidst all the “new” adventures with which sundry modern authors have felt obliged to saddle Sherlock Holmes, a visit to Borley must certainly have crossed somebody’s mind. Yet only one, Trevor Hall, has made the connection, using the Rectory as the setting for a privately published, 1986 novella, The Last Case Of Sherlock Homes. Unfortunately, what could have proven an excellent exercise in supernatural deduction emerged instead as a mundane (if complicated) murder mystery, with the reader’s disappointment compounded by the Holmes of the title not even being the real thing! Hall invented an illegitimate son for the great detective, and it is he who seeks to solve the case. Price smiled; “were this the real Doyle,” he later wrote, – he would know that I should require absolute proof of his identity.” The “spirit”‘s terse welcome fit the bill exactly. The seance lasted for over an hour, and not once, Price later marveled, did “Doyle” step out of character. Indeed, documenting this extraordinary afternoon in both Cosmopolitan magazine (January, 1931), and his own Leaves From A Psychist’s Case-Book, Price, having dismissed the standard accusations of fakery, seemed convinced that he had witnessed a genuine manifestation. Indeed, one subsequent event might even prove his point. During a seance staged at Borley in 1932, one person present claimed to have seen the spirit of a recently deceased, “well-known psychic researcher.” Respect for the dead man’s family apparently prevented the publication of his name at the time, but Doyle, one of the few men in that profession whose features were well-known enough to be recognized by a stranger, certainly fits the bill. Unfortunately, we will never know for certain, but if it was Doyle, what could be more fitting than that he should choose to visit the house which was so bedeviling his old adversary? Doyle would never again appear to Price, in this life at least, but still the old foes can be said to remain locked in combat. Throughout his writings, Doyle frequently predicted that it was simply a matter of time before conventional science finally embraced his beloved Spiritualism. Seventy years after his death, his prediction has still to come to pass, and the questions which vexed Doyle, and powered him through one of the most creative periods of his life, remain unanswered. So, however, do those which fired Harry Price’s remarkable energies; in that respect, at least, time has stood still, and in collecting the books which these two brilliant, but so contrary, men wrote, we can still experience the war of words (not to mention weirdness!) which not only captivated them, but which enthralled a watching world as well.